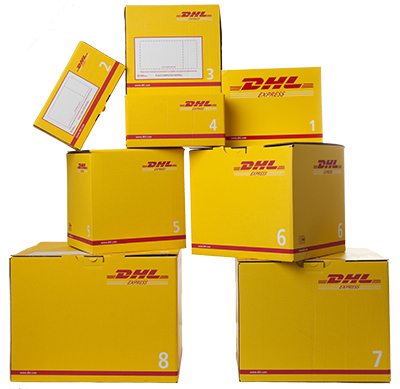 To ensure that your shipments travel safely and securely through the DHL Express global network, it is important that they are packaged and labelled correctly. If you’re reusing envelopes or boxes, please ensure that old labels and markings are removed. Securely affix the Waybill to the shipment. The Waybill can be thought of as the shipment’s airline ticket and if it becomes separated from your shipment, it will delay delivery. The barcodes on the Waybill are scanned at numerous points during your shipment’s journey. Please ensure the barcode is flat and not covered by tape, shrink wrap or strapping. Place the Waybill on the top or side of your shipment and please ensure it doesn’t overlap the corners or edges of boxes. Use adequate protective wrapping for fragile or delicate items and ensure they’re packed as far away as possible from the corners of boxes. To prevent injury to our staff, please pay special attention to the packaging of sharp items. There shouldn’t be any possibility of the contents piercing the packaging. Any individual pieces over 70kg should be placed on a pallet. If you’re sending a multi-piece shipment, it’s not necessary to place the individual pieces on a pallet unless they exceed 70kg. For example, a shipment comprising four 25kg pieces doesn’t have to be placed on a pallet.